Not to be confused with Standard German. Upper German (German: Oberdeutsch (help·info)) is a family of High German languages spoken primarily in the southern German-speaking area (Sprachraum). Upper German proper can be generally classified as Alemannic or Bavarian. 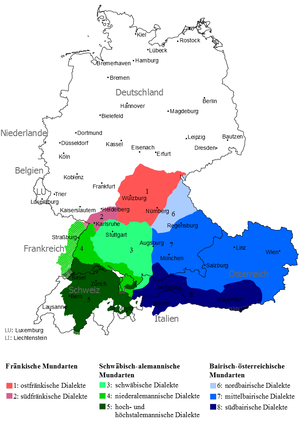 However, the High Franconian dialects, spoken up to the Speyer line isogloss in the north, are also considered part of the larger Upper German dialect group. Whether they should be included as part of Upper German or instead classified as Central German is an open question, as they have traits of both Upper and Central German and are frequently described as a transitional zone. Hence, either scheme can be encountered. Erzgebirgisch, usually lumped in with Upper Saxon on geographical grounds, is closer to East Franconian linguistically, especially the western dialects of Erzgebirgisch. Based on the fact that Langobardic, extinct around 1000, has undergone the High German consonant shift completely, it is also often classified as Upper German. However, if the High German consonant shift occurred late (7th/8th century), which now seems to be the prevalent view, it would seem to be anachronistic to do so. On the other hand, if Langobardic was still essentially identical to Bavarian or Alemannic at the time, the anachronism would disappear, and in fact, what is attested in Langobardic cannot really be shown to be systematically different in any particular point from the earliest attested form of Bavarian in the 8th century, apart from a few rather minor divergent phonological developments, which, however, seem to postdate the sound shift.